The following article appeared in the Bahrain tribune in 2004. The original Kerala type of architecture was changed recently and this i think shows the ignorance of people who control the mosque. Browsing through the annals of the royal family of the Samudris (Zamorins to western historians) – the traditional rulers of north Kerala from 7th century A.D to British days, – I was intrigued by one paragraph, which stated "There is the practice of receiving pan (betel leaf) from a Muslim woman when the King Samudri ascends throne for the first time and telling her 'I shall guard the sword (kingship) until my uncle returns from Makkah.' This custom continued until 1890s." "Why a Muslim women be given that assurance?" I mused, and checking with historians found, that in India, in the 1375-year-old (built in Hijra 629 or 7 A.D.) Cheraman Juma Masjid in Kodungaloor-Kerala, we have India's oldest Islamic shrine. More important is the fact that it is the world's second oldest Juma mosque, where the Juma (Friday) prayers have been held for the last 1375 years, since the days of Prophet Mohammed (570-634 A.D.). The first Juma mosque in the world is the Prophet's Mosque in Madinah, which is also his memorial tomb. Kodungaloor was the capital of the kings of Kerala, and in 622-628 A.D. (Hijra 1 to 7) the ruler was a great savant, by name Cheraman Perumal Bhaskara Ravi Varma. In those days, the seniormost of the rulers of Kerala was called as Cheraman Perumal. It was here that he was visited by certain Mohammadan pilgrims, who according to tradition, succeeded in inducing the Perumal to turn Mohammadan and undertake the Haj. On the eve of his renunciation of religion, empire and embarkation for Makkah, he is reputed to have distributed Kerala among the many Hindu princes whose scions ruled it until 1947. The founder of the Samudri dynasty, a nephew of the departing monarch, was one of the beneficiaries. Hence it became obligatory for all his descendants to assert to the Muslim woman as representative of the religion to which the Perumal had converted himself, that the new ruler was only the agent of the Perumal. Why did the Perumal convert himself into a follower of Prophet Mohammed? M. Hamiddullah writes in Mohammad Rasoolullah, quoting some old manuscripts from India Office Library (ref no. Arabic, 2607, 152-173) Vol.16 (06): "There is a very old tradition in Malabar, southwest Coast of India that Chakrawati Farmas (perhaps another name for denoting Cheraman Perumal) one of their kings, had observed splitting of the moon, the celebrated miracle of the Holy Prophet at Makkah, and learning on inquiry that this was a symbol of the coming of a Messenger of God from Arabia, he appointed his nephew regent and set out to meet him. The love for Holy Prophet grew in his heart and he became the earliest Muslim convert of present day India." This 'Moon Splitting' is also mentioned in the hadith. As per narrations of Abdullah bin Masud: "During the lifetime of the Prophet, the moon was split into two parts and on that the Prophet said, 'Bear witness (to thus).'" (Translation of Sahih Bukhari, Virtues and Merits of the Prophet and his Companions, Volume 4, Book 56, Number 830) To continue with the words of Hamidullah, Cheraman Perumal embraced Islam at the hand of Prophet. A tradition of the Holy Prophet has also been reported from one of the companions, Abu Saeed Al Khudri, regarding the arrival of Cheraman Perumal "a king from India presented the Messenger of God with a bottle of pickle that had ginger in it. The Holy Prophet distributed it among his companions. I also received a piece to eat." It is said that, after conversion, the Perumal took the name of Tajuddin, while other chroniclers say that he called himself as Abdullah Samudri, in remembrance of his past. He married the sister of the then king of Jeddah and settled down there. He handed over to the king of Jeddah several letters addressed to the ruler of Kodungaloor (then known as Muzuris), seeking his help to propagate the tenets of Islam. Later, unfortunately, when returning to Kerala, on directives of the Prophet, Tajuddin died at the port of Zafar, Yemen, where the tomb of the 'Indian king' was piously visited for many centuries. But he had asked his companions, among whom there were a number of senior disciples of Prophet Mohammad, to continue their journey to Kerala. One Islamic scholar has written that Perumal's followers built the mosque after reaching Kerala. 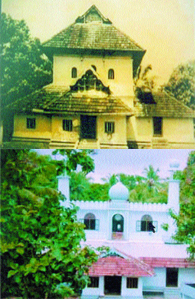 "The Cheraman Juma Masjid was built by Malik bin Dinar, (one of the 13 followers of Prophet Mohammad), who reached the ancient port of Musuris on the spice route in Malabar in 629 A.D. Cheraman Perumal had given a letter to the Rajah of Kodungaloor, who helped Malik bin Dinar to convert the Arathali temple into a Juma Masjid. As such this mosque was one, designed and constructed based on Hindu art and architecture. It has a unique speciality. Mosques all over the world face the direction of Makkah, but this particular one faces east, as it was built originally as a Hindu shrine, all of which face the east. This is the second Juma Mosque in the world, where Friday prayers have been offered since 1365 A.D./Hijra 7. It is situated in the Mrthala village of Kodungaloor, hardly 20km from the Irinjalakuda railway station in Kerala. Unlike any other mosques in India, the Cheraman mosque uses a traditional brass oil lamp, mostly found in Hindu temples. The pulpit from where the chief priest gives Friday sermons is made of rosewood with carvings similar to those in temples. There are two tombs, that of Bin Dinar and his sister inside the mosque, where preachers light incense sticks, yet another Hindu practice. Until 1984, for 1355 years, the Cherman Perumal Mosque retained its facade as a typical Kerala structure. In 1984, the local Muslim Jamaat, which repaired the building, decided, that the new structure should be more like a Islamic shrine with minarets. While retaining the inner configuration of the edifice, the exterior was changed completely. As one member of the Indian National Trust for Art " Cultural Heritage told me that in 1984 the trust was formed to protect the Indian heritage, from such radical alterations. But by 1984, the mosque had been given a new exterior. Otherwise the trust would have appealed and ensured that the 1355 old facade of the structure (although repaired many times) was kept in its old grandeur. photo: The original Cheraman Juma Masjid in Kodungaloor, Kerala, where Friday prayers have been held for the last 1375 years. Below: The mosque after local Muslims carried out renovations.